Spanakopita is a Greek spinach pie, a holiday comfort food that is so delicious and easy to make. 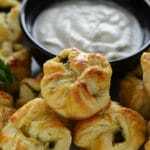 One of my favorite Greek appetizer recipes. 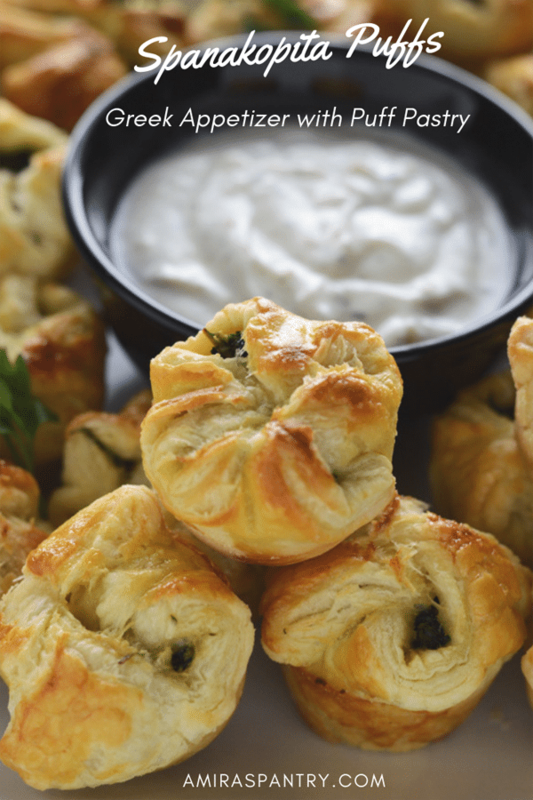 This spanakopita recipe is made even easier with the use of buttery flaky puff pastry. Spanakopita is traditionally made into a pie or triangles. 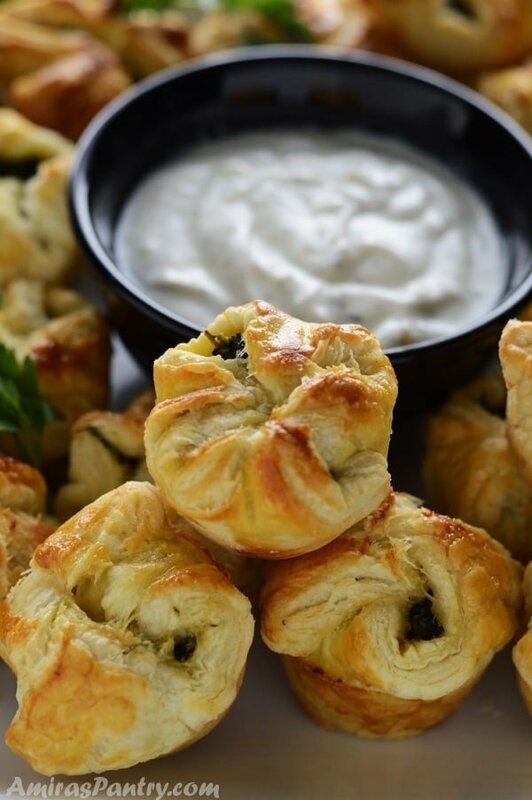 Earthy spinach filling flavored with herbs and feta cheese is stuffed between layers of crunchy buttery phyllo dough. 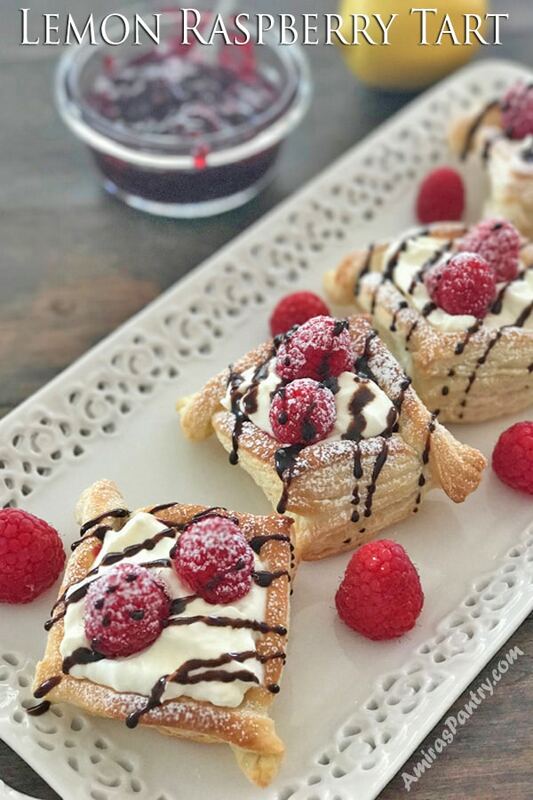 I’m pretty much used to working with phyllo dough and feel comfortable around it, but when I asked you on Instagram, you clearly stated that you like puff pastry more. 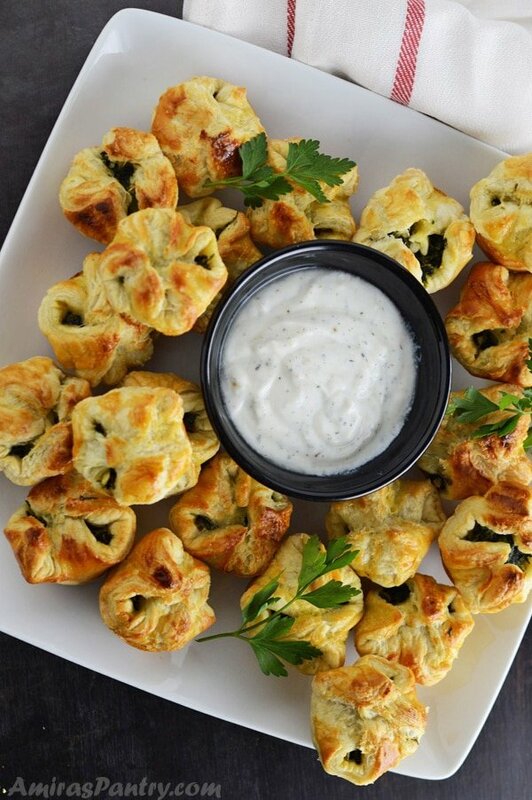 So here we are with an amazing side dish of Spanakopita puffs. 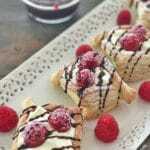 Try this festive lemon raspberry tarts. 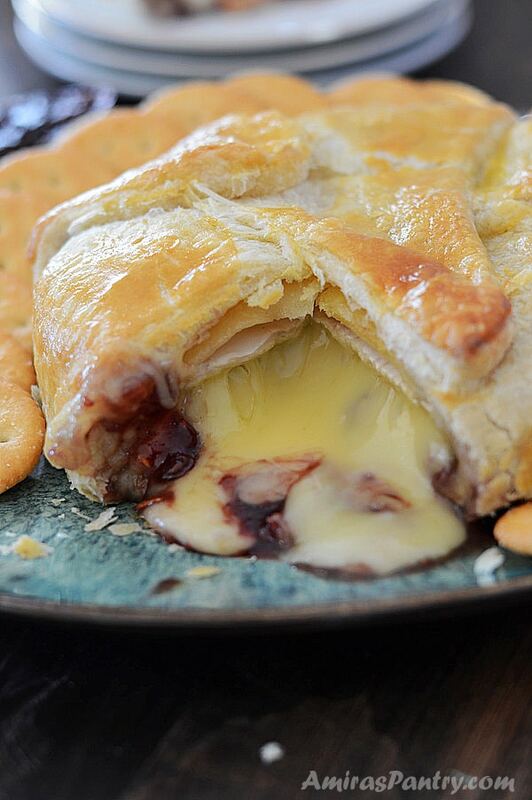 An easy dessert made with your favorite… puff pastry. Guys, you are in for a treat, seriously. If you struggle to eat spinach, or if you have kids who you struggle with to make them eat spinach, this is the answer. I could not believe my eyes when my kids devoured these. Thinking they were just hungry and will probably eat a couple then realize it has spinach!!. I kept warning them ” these have spinach…. these have spinach” and to my surprise, they liked it so much and I could hardly get myself and hubby two of them to just get a taste. I used to hate spinach when I was young, I hate everything about it . So I guess like mother like son(s). I guess if my mom knew this recipe back then, she could have convinced me to eat spinach as well. 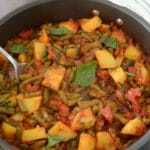 The traditional way of cooking spinach back then in Egypt was to make a beef stew with tomato sauce. My mom used to add a hint of cilantro to spinach which really gives spinach a nice flavor and more tartness. 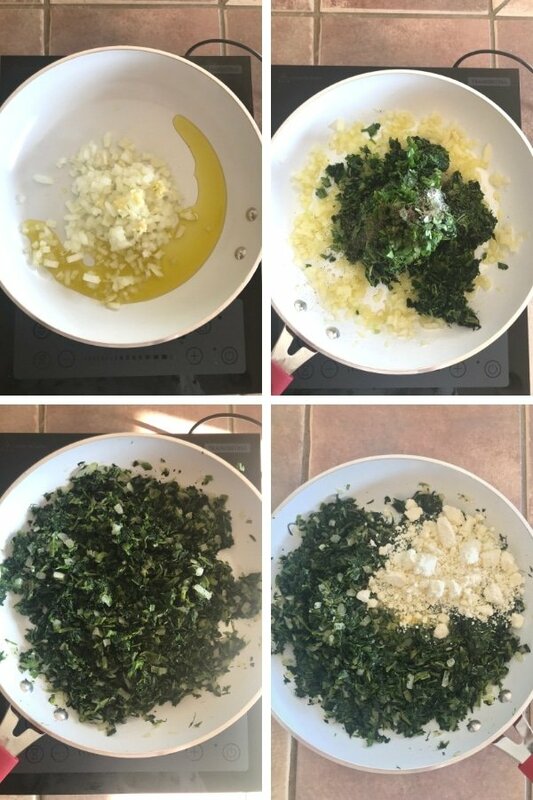 I used this trick in making this spanakopita but, if you do not have a taste for cilantro then skip it. Spanakopita is traditionally made into a phyllo pie. Somehow like this meat phyllo pie but the filling is different of course. Spanakopita filling is made with spinach and herbs like parsley, dill and I’ve also used cilantro. This is very forgiving so you can get away with skipping cilantro and dill but try to find parsley. Eggs and feta cheese is also added to the mixture. What to serve with spanakopita? 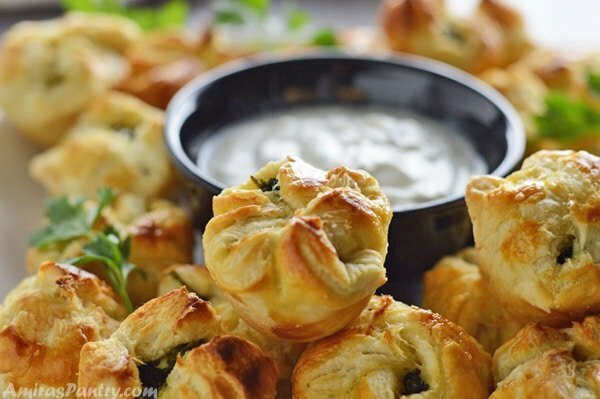 These spanakopita puffs are intended to be served as a side dish or starter. It is a great side for gatherings, especially in holidays. I liked it with tzatziki sauce, but you can serve it along any other Mediterranean dips like Hummus, Baba ganoush, tahini, or with any salad like this fattoush or eggplant salad. It goes perfectly with a main dish of kebab as well. How to make spanakopita quick and easy? We’ll start by making the spinach filling. I’ve used frozen spinach, thawed of course. Then I squeezed all the water I can with my hand through a mesh strainer. In a pan over medium heat saute onion and garlic in olive oil until fragrant. Add spinach, herbs and spices mixing everything well. Set aside to cool to room temperature before adding the eggs. When it has cooled down, mix in eggs and feta cheese. Unroll the first puff sheet and cut into 12 equal squares. Brush each of the mini muffin tin cup with melted butter, this step is optional, I just like to be 100% sure that it will not get stuck. Place a square in each cup, fill with the spinach filling. Fold it close and brush with eggs to seal. Dip them in your favorite dip, but these are incredible on their own. If you have leftovers, store in the fridge then warm them up a bit in the oven or microwave when ready to consume. Leftovers make great snack or lunch for next day. As we stated before herbs are optional, but highly appreciated, parsley is a must. You can use fresh spinach if you would like to, just make sure to squeeze all the water out. You can skip cooking the filling and just mix the ingredients well. This does not apply if you are using fresh spinach. I just like cooking it. I’ve used this mini muffin tin for this recipe, it has been with me for ages now. Works great each time and very easy to clean. 1/4 cup fresh parsley chopped. 2 Tablespoons fresh cilantro chopped. 1 Tablespoon fresh dill chopped. 3/4 cup crumbled feta cheese. 2 sheets frozen puff pastry thawed but still cold. In a pan over medium heat, sauté onions until fragrant then add garlic and sauté for another 30 seconds. Add spinach, parsley, cilantro, dill, salt and pepper mixing them all well together. Cook for 3 minutes then remove from heat and let it cool down for 10 minutes. Stir in one beaten egg and feta cheese. Preheat oven to 400F. Beat remaining egg in a small bowl. 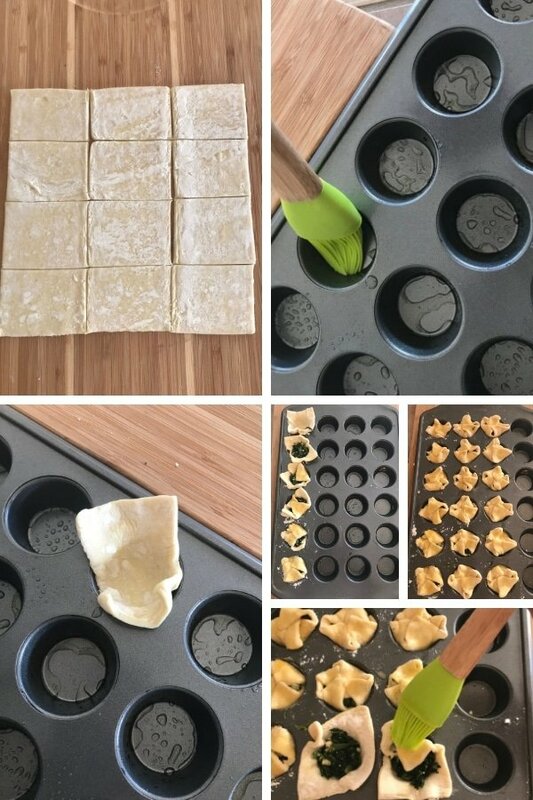 Cut pastry sheet into 12 equal parts. Lightly brush the cups of a mini muffin tin with butter or oil, this step is optional just to make sure that the puff pastry will not be stuck. 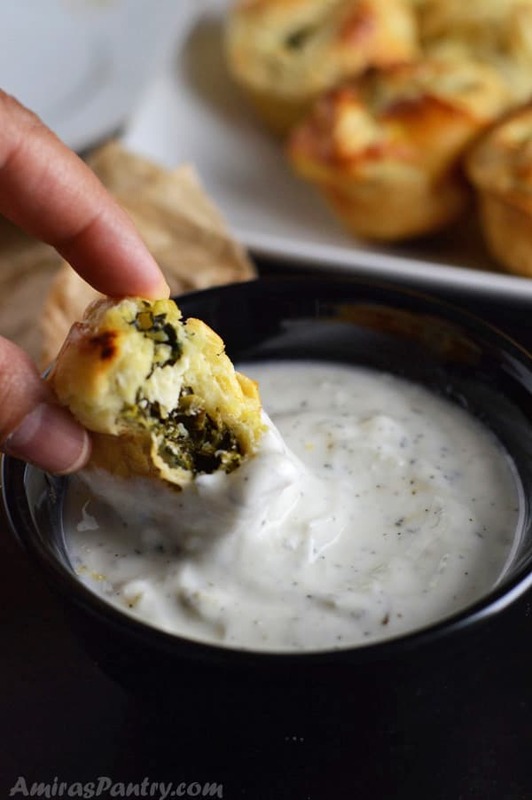 Press each puff square into the bottom of one muffin tin, fill with the spinach filling and fold pastry over brushing the top with the beaten egg. Asalaamu Alayakom ya Amira! I hope this message finds you and your family in the best of health. As usual thank you for the yummy and easy recipe! 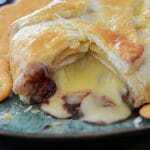 These are the next on my list of things to make ASAP. This sounds so good I’m not sure I’ll want to share with the rest of the family since I’m a spinich lover As always keep the tasty foods coming.